Numbers are not just for math geeks and people with useful college degrees. Number and the multitude of ways you can combine them make for a great mobile games as well. From the popular and time tested Sudoku to a more recent 2048, at least one of these games will surely grab your attention and make your brain do some work. 2048 is a single-player puzzle game, in which the objective is to slide numbered tiles on a grid to combine them and create a tile with the number 2048. You start with a randomly populated 4×4 grid. You move your number in any of four directions and when any two same numbers touch the result is their total sum. 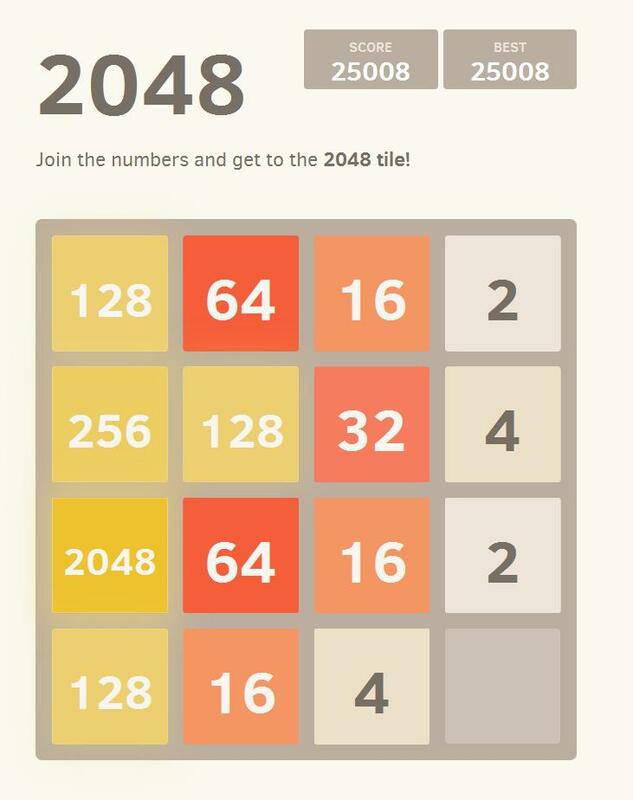 Once you get to 2048, the game ends. That is, if you don’t run out of moves. The game is translated into almost every language and supports automatic saving and every version of Android above 2.3. You also get two modes – the regular one and time trial where number are added automatically after certain amount of time. You can download 2048 from Google Play Store or simply try it out in your web browser by going here. In this game you get to play with a single digit numbers. The player has to clear to gaming board from all bubbles which represent a certain number. The game ends only when bubbles cross the top border. The user is in control of where numbers fall and he gets to see three next numbers. Numbers disappear in two cases. First, when there is a certain number of them on a playing field. This number is determined by a numerical value of each bubble. For number 5 there has to be at least 5 bubbles, and so on. The second way is counting of the numbers. You can choose from 3 difficulty levels. Easy mode lets you play without any timers, so that players can enjoy the game at their own speed. Medium difficulty settings adds the timer and new bubbles are automatically displayed after five seconds. The expert level makes you face not only the timer but also a new type of bubble. This bubble disappears only when player has a certain score which is written on the bubble. Users say that Numbers Addict improved their memory, cognitive and concentration flexibility and stimulated brain cells that were asleep. If that sounds good to you, head over to Play Store and have some fun. Numbers Quiz is based around well known and sometimes dreaded sequences of numbers that you are probably familiar with from school. Your goal is to figure out which number is logically the next correct one in the sequence. You start from the easiest riddles and quickly move up in difficulty. For every solved riddle you get 5 coins which you can in turn use when you get stuck and can’t solve the problem. You can also play against your friends by simply inviting them for a math match. Download Numbers Quiz for free from Play Store. The objective of Sudoku is to fill a 9×9 grid with digits so that each column, each row, and each of the nine 3×3 sub-grids that compose the grid contains all of the digits from 1 to 9. The modern Sudoku only started to become mainstream in 1986, but only became officially recognized as being common in western media publications in 2005. Today, we get to enjoy this addictive and challenging game on almost all of our devices. Play Store offers a wide variety of both free and paid games. On of the most popular and well rated is simply called Sudoku Free. With its four difficulty settings, intuitive interface and automatic saving feature you can enjoy a game of Sudoku everywhere. The only downside may be the slightly dated graphics. If that is something that bothers you too much, you can always search for another version. Threes! is an indie puzzle video game by Sirvo that remained for several weeks in top places among paid games. It is no surprise really, with the simple concept, pleasant music, intuitive control system and above all great design, Threes is one of the most likable games in Play Store. It all starts with a simple idea that is not entirely easy to master. You move tiles on 4×4 grid and you goal is to combine addends and multiples of three. Each round you select in which direct should your tiles move and when two tiles with the same numerical value overlap they merge into a new one with a value equal to their total. Two threes make six, two sixes make twelve and the game continue in this manner all the way into a four digit numbers. That sounds simple, right? Well, it is, but it also isn’t. Each overlap makes one tile disappear but each move also makes a new tile appear on a empty space. The games ends when all 16 tiles are full and you cannot make any moves. You can see the value of the number that is going to appear next and you have to make sure to take it into a consideration, otherwise you won’t get far in this game. One aspect that hugely contributed to the success of this game is its graphic design. The minimalistic design is though out from every aspect. For example, numbers from 3 up have their own individual “personality” with an original graphic and sound design. The lower numbers can act a little shy, while the higher numbers are not afraid to tell you what is on their mind. The game costs $1.99 and for that money you cannot go wrong. Grab it from Play Store and have some good fun.